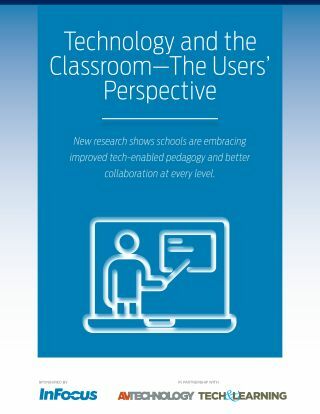 New research from NewBay’s AV Technology and Tech & Learning magazines—from a poll of more than 200 users of educational technology in K–12 and higher education—shows how technology leads to increased engagement and more use of online resources, thereby improving educational outcomes. Although the survey showed that many higher education and K–12 schools remain at a crossroads in terms of making a full transition to technology, the vast majority of those who responded are excited about what they’re accomplishing today and are equally excited about moving quickly to implement better ways of teaching with online curriculum and to take advantage of online avenues for research, better displays, video conferencing, and more. While there’s still a technology gap in many schools, it’s a gap that up-to-date projectors, large displays, better networking/connectivity solutions, and better teaching software can fill. The survey results offer a roadmap showing what technology and tech-based pedagogical methods are working for schools today, as well as what’s to come.